French toast is a classic breakfast item either at home or in restaurants. 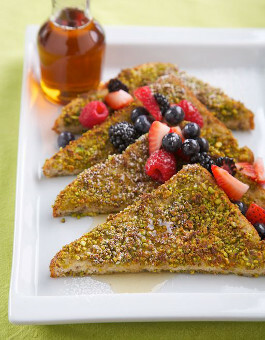 I developed a great version of French toast, coating it with ground pistachios. 1. Mix the eggs, milk, sugar and vanilla just until combined and pour onto a plate. 2. Combine the pistachios and cinnamon and put on another plate. 3. Dip the bread in the egg mixture, soaking until just before the bread breaks. Dip in the pistachio mixture. 4. Spray a skillet with vegetable oil and brown the bread for 4 minutes on each side or until browned. 5. Garnish with maple syrup and fresh fruit, if using.